Ayahuasca (yage) is a brew made of Banisteriopsis caapi vine (vine of the soul), often in combination with various other plants. It is a natural spiritual medicine used by indigenous people from the Amazonian Peru. Many people who have consumed ayahuasca have spiritual awakenings regarding their purpose on earth, the true nature of the universe and insights into how they can tap into their infinite potential by accessing other dimensions and existences in space-time. There is an enzyme in your stomach that is in charge of breaking down compounds such as histamine, adrenaline, dopamine, serotonin, melatonin, etc. called the monoamine oxidase enzyme which also breaks down dimethyltryptamine (DMT), when taken orally. Auahuasca is the name of the brew but also that of the vine. There are many different types of brews called ayahuasca simply because it is the fundamental ingredient in all of them. The vine alone, is a strong purgative and has been said to produce visionary states. It contains a family of chemicals called the harmala alkaloids, which are the source of the purge but are also an inhibitor of the monoamine oxidase enzyme, or MAOI. There are a number of other plants that could potentially be added to the brew from here. Commonly, Chacruna or Wambesa are added as helper plants that contain DMT and increase the intensity of the visions. Mapacho is commonly added. It contains nicotine and harmala alkaloids. Many other plants can be added to the mix, not all being for chemically obvious medicinal purposes. Specific plants can be added by the shaman to treat certain conditions. Crystals and minerals have healing properties through their own consciousness, a resonance or vibration as unique as our own DNA. They capture light to reflect back to us what is needed to gently push us along our journey. Crystal healing uses the subtle energies of crystals and gemstones to heal and protect other organisms. When a crystal is applied to a body’s electromagnetic system, it transfers the energy of its particular vibration or frequency to restore balance, clarity, and the natural energies that have been compromised or depleted in an energetic field; in short, it releases the blocks that impede potential. By definition, each mineral has its own crystalline structure composed of specific atoms and chemical bonds. Every chemical has characteristic, transferable, vibrational and rotational frequencies; these can be measured by using spectrophotometers to translate the vibrations and rotational band frequencies. Although crystal healing at this time is considered an “alternative medicine,” it has been used for centuries. Its roots are in ancient Egypt, but China and India have also used the properties of crystals for healing purposes for over five thousand years. Changes in temperature create an electrified state (static electricity) resulting in the polarity of the crystal, meaning that one end will repel while the other end attracts. Body temperature, when holding or “laying-on-of-stones,” activates the principles of pyro-electricity. The energetic exchange of atoms is dictated by the atoms of the crystal and the atoms of the person holding it. Positive and negative charges, which are symmetrical within the crystal, cause the connection to be electrically neutral. When stress is applied to the crystal, the symmetry is slightly broken, and this creates voltage. Every crystal on earth has this ability, but crystals from the quartz family are the most powerful generators and “healing amplifiers” on earth due to their unique helical form. They are said to bring the “energy of the stars into the soul.” Like natural computers, they store, sort and access information to facilitate memory and concentration, and this makes them the most effective crystals for programming. They attune their vibration to each situation as needed, and work from the energy of homeostasis to absorb, store and release energy and thoughts, thus facilitating memory and concentration and removing blocks to encourage flow. Every individual has vortices of energy in their etheric body (the subtle body closest to the physical body) that spin energy in from their astral body (the bridge between the physical plane and the spiritual plane) and beyond. The seven major body chakras are aligned along the vertical mid-line from the base of the spine to the top of the head. Like a radar dish in a research center, the chakras serve as memory banks, storing vast quantities of information from previous and current lifetimes, as well as possibilities in the future. You can think of them as rotating tetrahedrons that receive and radiate their own level of consciousness or sensations of awareness of energy, acting as transformers to specific points where there are nerve plexus or ganglia. The nerve centers that translate the vibrations received in the area are generating nerve responses that are experienced on a physical level. These responses are the re-actions people experience as feelings that have a direct influence on their daily lives, whether they acknowledge that influence or not. What is the Inter-Galactic Federation of Light? I will never forget the day that Ahnje appeared in my living room. I had just completed my internship to meet the qualifications to become a certified practitioner of the Yuen Method TM. I called my mentor, Tai Njio, to inform her that I had good news and bad news. The good news was, that I was certifiable, the bad news… not in a good way! I informed her that there is a very large dragon in my living room. Her voice was so hypnotic, the sound of tinkling crystals and raindrops splashing. She smiled at me and the breast-plate on her chest began to glow. I could feel my heart open and expand until I was enveloped by the most comforting, warm sensation of unconditional love. Our eyes locked and we held each other’s gaze. I told her it would be my pleasure to be of service. Her physical image slowly spiraled and dissipated into thin air. Tai’s deep silence was finally broken and she replied, “Well, you’re strong to it!” We both giggled, and so began a decade long communication with the dragons that continues to this day. Since then the dragons appear to me as a complete work of art. As I am painting them they channel information to me, sharing their knowledge and wizdom. I know when they are satisfied that I have captured their essence when the next painting makes its presence known. I am not a big fan of channeled information because I feel we all have a direct line to God. Why speak with intermediaries when you can go straight to the head boss! However, after a decade of working with the dragons and testing the information, I feel strongly that it is time to unleash their loving communication. (I have found, over the years, that it can be challenging to ignore a dragon when they are ready to spin their tale!). So many people from all around the globe who have attended my seminars, worked with me in private consultations, listened to The Truth Is Funny radio show, read my book, etc., have connected with me to share loving stories of how the dragons have appeared to them and calmed them in a time of danger or high stress. Over the last decade, I have done my best to avoid reading books, watching movies, etc. regarding dragons or looking into other’s experiences with the Inter-Galactic Federation of Light to keep my perception of the information pure, testing it as it comes to me. I did not understand much of the information I received in the beginning but as I educate myself, it becomes more and more clear. After returning from Peru in January of 2016, after attending ayahuasca with shaman Ron Wheelock, I came to the realization that the profound information I received in ceremony is part of this oracle and also began to paint my visions to impart the knowledge to others. MANY PEOPLE THINK THE OPPOSITE OF LOVE IS FEAR; IN FACT THE OPPOSITE OF LOVE IS DISRESPECT, FOR ONESELF, FIRST AND FORMOST! WHEN WE HAVE RESPECT FOR OURSELVES WE ARE IN RESONANCE WITH THE UNIVERSE AND AUTOMATICALLY SHARE UNCONDITIONAL LOVE WITH OTHERS. Vectors are used in science to describe anything that has both direction and magnitude. They are usually drawn, in equations as pointed arrows, the length of which represents the vector’s magnitude. For instance, wind has a vectorial quantity because it blows in a certain direction at a certain speed. If you think about a quarterback throwing a pass down the field, the ball has both direction and magnitude depending on how hard it was thrown. In an equation representing this action, the direction of the vector arrow marks the ball’s direction and the length represents the speed of the ball. The only possible geometry that is in equilibrium in all vectorial directions (other than the sphere) is the cuboctahedron because the length of the radiating vectors and the edge vectors are equal. In this book, I am referring to the vector as the moment in time and space that has the direction and the magnitude to qualify an answer that determines the best position to take in relation to one point of space with another. The definition of an oracle is something that is regarded as a reliable and sure guide. Oracles can be used to nudge us towards intuitive insight and guidance. The card(s) chosen reflect the answer(s) back through our Higher Self. Can energy correcting cards and paintings also be used to instill negative energy? These paintings and cards are about unconditional love and are capable of nothing but that. This love has been percolating on the back burner for close to a decade now and they are insisting on being here for us NOW! If people choose to try to use the dragons in a negative way, the negativity will be removed, replaced and recycled into divine love. Cause and effect is a universal law, so people who choose to try to take others down to make them selves feel better, will most certainly feel that effect. The dragons are fierce and intent on their purpose; they choose to be as gentle as possible and also cultivate the understanding that true freedom comes from discipline of the mind and a person’s thoughts. The universe will always steer events in the most loving, gentle way possible in alignment with authentic desires, unless people insist on doing things the hard way. How can paintings influence the energy in a room? The tools of Feng Shui are used to balance what are commonly referred to as the elements of fire, air, earth, water and ether. When the elements in a home, business, office, school, vehicles, etc. are out of balance, the energy can be changed using color, furniture, paintings, statues, crystals, light fixtures, textures, plants, and energy correcting cards. Balanced Feng Shui can make substantial energetic improvements in your physical environment to attract beneficial relationships and co-operation between members of a family, friends, associates in business, finances, careers, fitness, romance, youthfulness, health, wealth and happiness. How do energy correcting cards work? 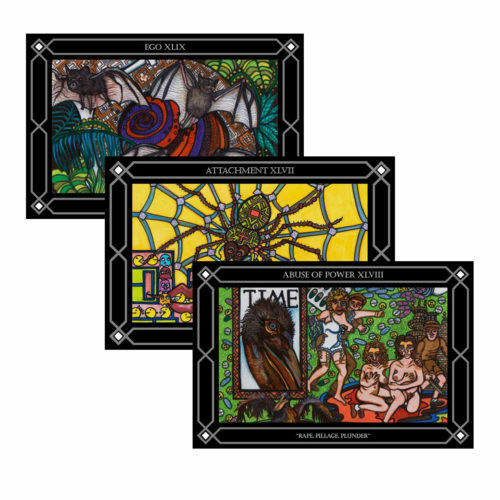 These magical cards have been a decade in the making, imprinted by Colette with intentions to shift energetic weaknesses into alignment with your authentic desires. On average each dragon painting takes from three to six months to complete. 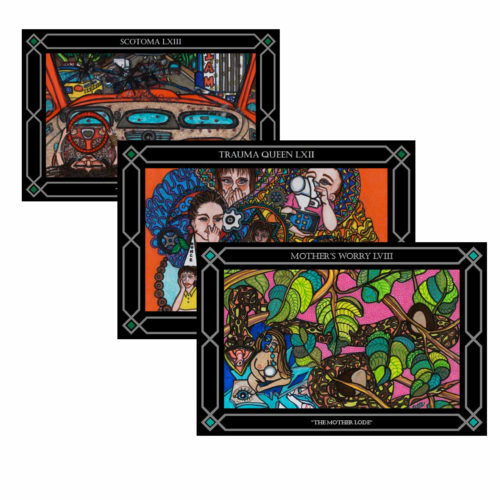 The entire time Colette is working on them, she is correcting the issues that are brought up on a Universal scale and has infused that energy into every card. The original paintings are adorned with Swarovski Crystals, other gems and infused with the innate wizdom of the dragons. 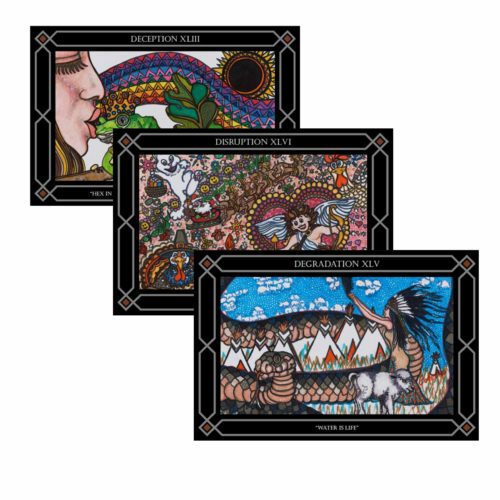 Each card is designed to accelerate universal love through the qualities of crystals and the element of fire. Why does the oracle consist of sixty-four cards? The sixty-four cards represent the sixty-four tetrahedron grid of the Merkaba. This is the divine light considered by ascended masters as the vehicle they use to connect with and reach those in tune with higher vibrational realms. “Mer” means light, “Ka” means the spirit body, surrounded by counter rotating fields of light, “Ba” means the physical body. Spirals of energy in DNA transport spirit/soul/body from one dimension to another, allowing access to enlightened information. Your personal Merkaba is two tetrahedrons connected by the two overlapping bases. The point of masculine polarity is at the top tetrahedron, facing towards the Great Central Sun. The point of feminine polarity faces the Earth. Your Merkaba is a torus of information inspiring you to tap into infinite potential. It is a feedback loop that gives you access to intuitive insight to live your authentic desires as a whole being.